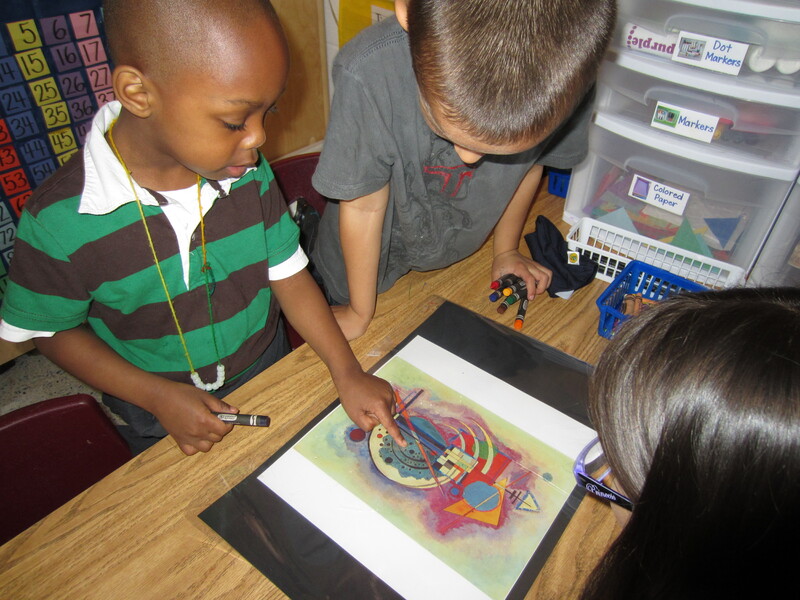 My kindergarteners have been looking closely at the artwork of Wassily Kandinsky as we learn about geometry in math. We are using his art to explore shapes, lines, color and important vocabulary for positional words that are part of our state standards. I’m using Kandinsky’s art just like I use mentor texts throughout my literacy workshop. It’s been very exciting to see how the children are learning math while “standing on the shoulders” (as Katie Wood Ray says) of this artist. His fascinating abstract art paintings engage my students and allow us to surround our math instruction with rich talk about a variety of geometric terms, as well as art terms. For example, mathematicians use the term “rhombus”, but artists use the term “diamond” to speak about the same shape. We are creating an ongoing shared writing text with what we are noticing. This writing that came from their talk looked like this: I see a red square next to a blue curved line. I see a big yellow curved line overlapping a black circle. I see 5 small circles under a pink rhombus. Last week we used the program Pixie in the computer lab to create our own Kandinsky inspired works of art. 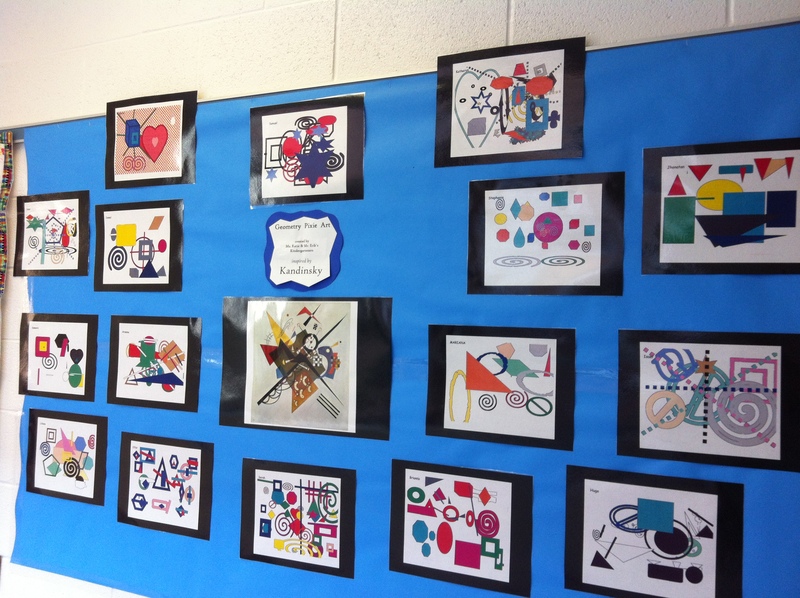 The students used a variety of shapes, colors and lines to create their own work of art. They talked about how they were choosing the placement of their shapes and carefully planned out their work. This week we are creating our very own “Kindergarten Kandinsky” wall mural as we use his work as our mentor text to create a piece of art showing our knowledge of shapes, colors and lines. Stay tuned for an upcoming post about this! I value the importance of visual texts, such as our Kandinsky pieces, as another form of literacy. Teaching children to read art, to create art from using artists as mentors, and to talk about art is a key piece of my literacy instruction. How do you use visual art in your teaching? 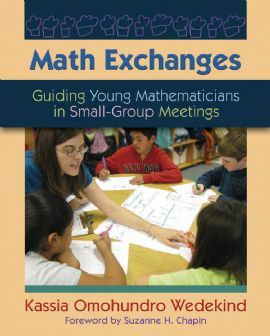 Pat and I have the pleasure of kicking off a blog tour on October 3rd for a new math book from Stenhouse Publishers – Math Exchanges by Kassia Omohundro Wedekind. You may be wondering why we are reviewing a book on math here at Catching Readers. Well, Math Exchanges stands on the shoulders of great literacy thinkers such as Regie Routman, Lucy Calkins and Debbie Miller as the author shows us how conversation through the workshop approach in math is as powerful for teaching and learning with young mathematicians as it is for young readers and writers. If you are anxious to start implementing powerful small group instruction through a Math Workshop, Math Exchanges is now available and can be previewed on the Stenhouse website. Kassia also has a blog where you can read more of her great math thinking. Check back on October 3rd as we launch the blog tour!